The low pressure area called System 96P in the South Pacific appears to be getting organized in infrared satellite imagery from NASA. System 96P is showing signs of strong convection and that has prompted the government of Vanuatu to issue tropical cyclone warnings today. Vanuatu is an island nation located in the South Pacific Ocean. A tropical cyclone warning is in effect today for the Sanma, Penama, Malampa and Shefa Provinces of Vanuatu. Strong winds and heavy surf are expected in the next 12 to 24 hours in the warning areas. 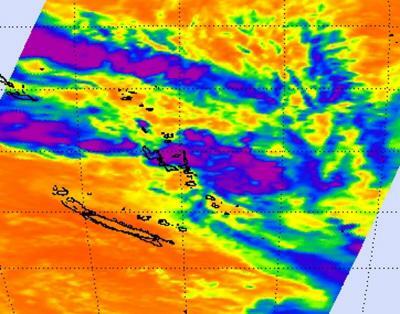 Local updates are available on the Vanuatu Meteorological Service website at http://www.meteo.gov.vu. At 0600 UTC (1 a.m. EST) on March 8, 2011, System 96P was located about 220 miles west-northwest of Vanuatu, near 16.3 South and 164.7 East. Maximum sustained winds are estimated between 20 and 25 knots (23 mph to 29 mph/37 kmh to 46 mph) with higher gusts. When NASA's Aqua satellite passed over System 96P on March 8 at 14:05 UTC (9:05 a.m. EST) the Atmospheric Infrared Sounder (AIRS) instrument captured an infrared image of the storm's cloud temperatures. The imagery showed increased deep convection (rapidly rising air that forms the thunderstorms that make up a tropical cyclone) over a developing low level circulation center. Despite some stronger convection, the western side of System 96P is in a region of high vertical wind shear. That wind shear is being generated by an upper-level low pressure area. Wind shear means winds that can weaken a tropical cyclone. Cloud temperatures are a key in determining storm strength. The higher the cloud tops, the stronger the convection and the stronger the thunderstorms are that power a tropical cyclone. That's why infrared data from AIRS is so important to forecasters. AIRS data showed that most of the coldest, highest cloud tops and strongest thunderstorms were still east of the island nation at that time. The coldest cloud tops were as cold as or colder than -63 degrees Fahrenheit (-53 Celsius). The Joint Typhoon Warning Center forecasters give System 96P a "fair" chance at becoming a tropical depression in the next 24 hours, and residents in the region of Vanuatu should make preparations now.